Keith Olbermann has hosted primetime news and sports shows in the past, but as GQ’s special correspondent, he now hosts a YouTube show in front of what appears to be construction paper. The first season of his show was titled “The Closer,” and now following President-elect Donald Trump’s election he hosts “The Resistance.” He has over 50 episodes and none have gotten more than 1 million views on YouTube. Olbermann’s interview with White House press secretary Josh Earnest got less than 100,000 views. The GQ special correspondent started it with asking “is [President Barack Obama] allowed to have opinions” about the election? This question came more than three months after the president endorsed Hillary. Before his time with GQ, he had hosted shows for outlets such as Fox Sports, ESPN, and MSNBC. There is more to Olbermann’s show then the cheap-looking set. Every episode shares a common theme of hyperbole. “One thing about Keith, he’s not hiding anything. He is as pompous and unhappy as he seems on TV. It’s all completely real,” a former coworker told TheDC. Olbermann has not only been over-the-top during his time with GQ, he has also practiced shoddy journalism. 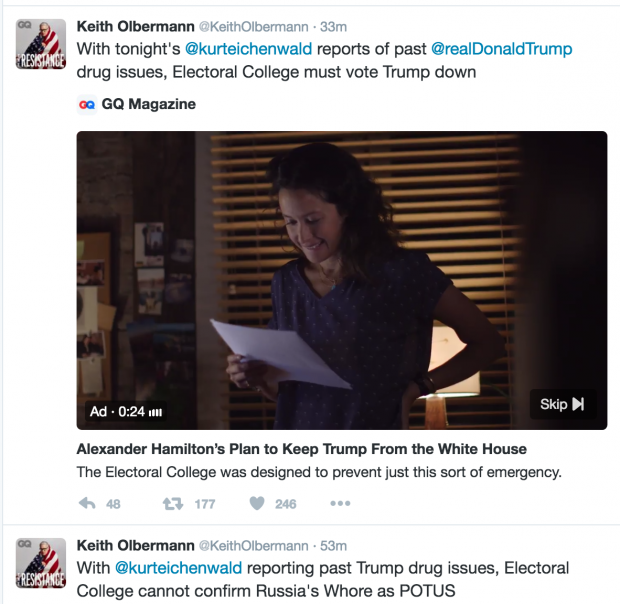 On Thursday night, Olbermann tweeted a link to one of his videos “Alexander Hamilton’s Plan To Keep Trump From The White House,” and commented, “With [Kurt Eichenwald] reporting past drug issues, Electoral College cannot confirm Russia’s Whore as POTUS.” Calling Donald Trump a “Russian whore” isn’t the newsworthy bit about the tweet. The issue here is that the reporting Olbermann is referencing doesn’t exist. 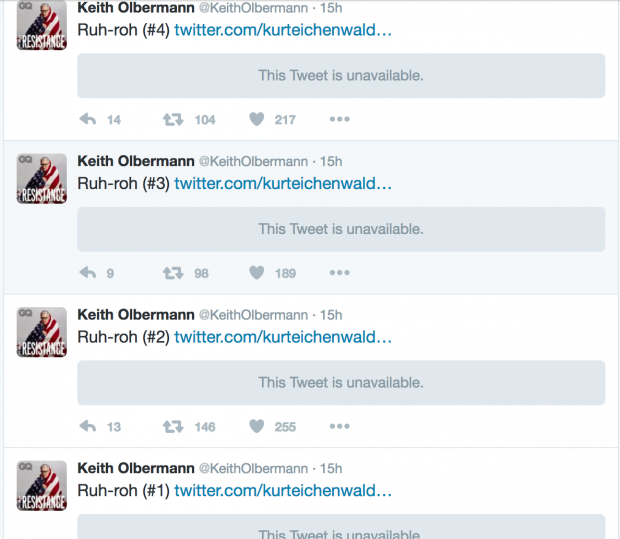 Eichenwald, a senior writer at Newsweek, has never written an article for Newsweek about Trump having drug issues. On Twitter he once wrote, “I believe Trump was institutionalized in a mental hospital for a nervous breakdown in 1990, which is why he won’t release medical records.” He subsequently deleted this tweet and refused to back it up in an interview on Fox News Thursday night. He claimed on Twitter after the interview to have medical documents showing Trump used amphetamines, Eichenwald has not shown these documents and nor does this claim mean Trump has a drug problem. TheDC has reached out to GQ to find out if this reporting by their special correspondent is up to their standards. GQ has not replied to multiple phone calls and emails regarding whether it is a problem for their journalists to refer to non-existent reports. TheDC was not able to reach Olbermann for comment.